The chainset and its component parts – cranks, bottom bracket and chainrings – lie at the very heart of your bike’s drivetrain. It needs to be strong, light, durable and of course, value for money. Chainset choice is determined not only by the type of bike you are riding – BMX, MTB and road chainsets are not interchangeable – but also by the type of riding you prefer. Road and MTB racers will favour light weight above all else while more leisure orientated riders will perhaps look for long-lasting chainrings and bearings well sealed from the elements. BMXers will need super-strong units that can take the punishment of jumps, drops and stunts while gravity riders will also look for balance of strength, durability and light weight. Your chainset consists of number of different parts – cranks, bottom bracket (together called crankset) and chainrings. Cranks – Two crank arms are mounted either side of the from at 180 degrees to each other, connected by an axle. The axle is threaded through the bottom bracket (BB) screwed into the frame’s BB shell, located at the meeting point of the seat tube and down tube. The pedals are attached to the other ends of the crank arms. Crank arms can be made from a range of materials, including steel, aluminium and carbon fibre. Steel cranks are common on older bikes and BMXs, with aluminium found on most low- to mid-range road and MTB cranksets and the lightweight but expensive carbon fibre generally reserved for high-end cranksets intended for racing, on-road or off-road. For road and MTB bikes, aluminium cranks are considered to be tough, stiff and light for the price. Most manufacturers will make some efforts to shed weight while maintaining stiffness, with some favouring hollow crank arms and others machining away excess metal. A key consideration when upgrading or replacing crank arms or cranksets is crank length. Most cranks for road and MTB use are 175mm long, but riders with legs shorter or longer than the average may feel more comfortable on cranks that better match their measurements. Options from 165mm to 180mm cover different limb lengths – it could be worth your while to research what crank length is recommended for your inside leg measurement. Chainrings – Chainrings enable the chain to drive the rear wheel, with the spaces in the chain fitting in between the teeth around the edge of each ring. Rings are generally made from lightweight aluminium alloy or, as is often the case with small and middle rings on mid-range cranksets, less expensive steel. Rings are bolted onto a four or five-arm spider. The size and number of chainrings will depend on the bike type and riding discipline, with BMX bikes having one chainring and road/MTB bikes having one, two or three depending on the riding discipline and desired range of gears. Bottom bracket – The bottom bracket is the engine room of the crankset, consisting of an axle which rotates inside a number of sets of bearings, which ideally are long-lasting and sealed from the elements.BBs have evolved considerably in recent years, with the older-style cartridge BB (where the axle and bearings are contained in one easily-replaceable tube) now largely superseded by the external BB, which puts larger bearings outside the frame, near the end of the axle. External BBs offer increased stiffness and lighter weight, but if you are upgrading from an older-style square-taper cartridge BB you may consider having your BB shell professionally faced (where the opposite sides of the shell are ground down to ensure perfect alignment) to prolong the life of your bearings. Whatever your bike, and whatever your riding, some principles remain constant. Our guide will help you understand not only the basics of crankset construction and technology, but also the merits of various models on the market. Which MTB crankset is right for me? For MTB riding, the chainset you choose will depend on the type of riding you do and the type of bike you ride. Chainsets designed for pedal-heavy mtb disciplines such as cross-country (XC) racing will need to be light in weight and offer a wide range of gears, while those aimed at the gravity market will need to be stronger at the expense of light weight, and will use a narrower range of gears. 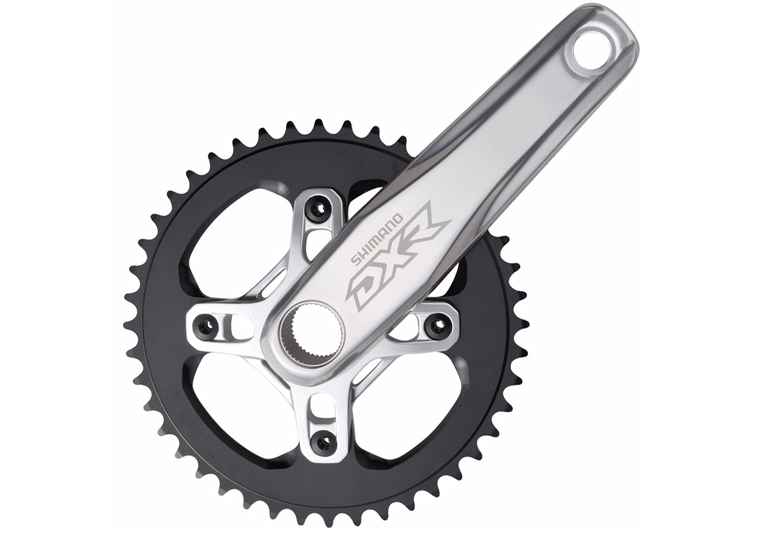 For many years the vast majority of XC and trail mountain bikes feature a triple chainset with 44, 32 and 22-tooth chainrings for maximum gear range. Although this setup may still be found on many bikes, lots of riders now prefer to run a double or single chainring up front (and a 10-, 11-, or 12-speed cassette in the rear), with the lighter weight (in the case of a single ring, dispensing with the front derailleur as well as the extra rings) more than compensating for the narrower range of gears. XC racers on a mission to shed weight will look at the higher end of the market, perhaps considering carbon fibre as an option, while long-distance riders looking for durability should consider ceramic bearings and chainrings, a step above basic steel or alloy. Meanwhile more extreme riders have long favoured single- or double-ring chainsets with a bashguard and chain device setup instead of a little-used big ring. Gravity riders also look for features such as steel pedal inserts on crank arms to prevent damage to softer aluminium threads inflicted by hard landings. MTB cranksets generally differ in three ways – crank length, bottom bracket (BB) type and number of chainrings. Crank length: Most MTB cranks are 175mm long, but riders with legs shorter or longer than the average may feel more comfortable on cranks that better match their measurements. Options from 165mm to 180mm cover different limb lengths – it could be worth your while to research what crank length is recommended for your inside leg measurement. The vast majority of MTB cranksets will use aluminium cranks but carbon fibre versions for ultimate weight savings can be found on top-end models. Bottom bracket (BB) type: Bottom brackets can be either the modern external BB setup, where the bearings are contained in two rings fixed to the outside of the bottom bracket shell, allowing the use of a large-diameter hollow axle for improved stiffness, or the older cartridge type, with a smaller diameter axle and internal bearings contained in a metal cylinder that screws into the BB shell as a single unit. The external BB setup means greater stiffness for less weight, but it can have drawbacks. Bearings can die quickly if they are not perfectly aligned, and it is often advised to have your BB shell professionally faced (where the opposite sides are ground down to ensure they are perfectly parallel) for maximum longevity. Ceramic bearings are also regarded as longer-lasting and smoother-running than standard steel ones. When replacing a cartridge BB, care must be taken not only to ensure that the new unit is the right size for your frame (BB shells are generally 68 or 73mm wide on MTBs, or 68/70mm on road bikes), that the axle is the right length, and also that the axle-crank interface matches. Different manufacturers have used different standards over the years, with the most common being ISIS splined axles (Race Face, Truvativ, FSA), Octalink splined axles (Shimano) and square taper axles (common on budget cranks from a variety of manufacturers). Check what size and standard is used on your old model before choosing a replacement – most cartridge BBs will have their model no. and specifications printed on an external sticker, making them straightforward to replace. Chainrings: MTB chainsets will use one, two or three rings, depending on intended use. • Single ring: Single rings were originally used by gravity riders who spent most, if not all, of their time descending, and so didn’t need a wide gear range. However pioneering work by SRAM to introduce 11- and 12-speed cassettes widened the gear ratios achievable with a single ring up front, bringing them into the domain of enduro and cross country riders. Today they dominate the trails. • Double ring: Double rings are still used by some MTB riders but their gearing ranges have been equalled by the huge ratios achieved by 11- and 12-speed cassettes used with single ring cranksets. However, some riders continue to favour their double rings despite the extra weight, and good savings can be made as quality two ring cranks continue to be released for less senior hierarchies. • Triple ring: The development of huge cassettes mean triple ring cranksets are now all but an obsolete technology, particularly on mountain bikes, appearing only as stock on entry-level budget bikes. MTB chainsets tend to have significantly fewer teeth than a typical road version. Double ring MTB chainsets usually come in three sizes, with the largest being a 38/28 teeth format, and the smallest being 34/24, useful for those facing big gradients. Single ring chainrings tend to come in one size per brand, usually in 32, 34, or 36 tooth formats. Which road crankset is right for me? Road bike chainsets can be loosely grouped into two types – traditional and compact, with the former geared towards advanced riders and the racing end of the spectrum, and the latter offering ‘easier’ gearing options for leisure riders. – Single chainsets use the same wide cassette technology as single-ring mountain bike chainsets. Pioneered by SRAM, the technology is yet to be fully adapted by the other big manufacturers Shimano or Campagnolo, but their popularity is growing and used by a increasing number of professional race teams to varying levels of success. – Traditional chainsets will feature a double chainring setup with 39- and 52-tooth chainrings a common standard. These combined with 10-, 11-, or 12-speed cassettes offer a wide choice of gears for climbing, while the big outer chainring ensures the traditional setup is more suited to hard-riding cyclists who can sustain a high pace, such as a race or training situation, or where the terrain predominantly consists of flat, smooth surfaces. – Compact chainsets span the mid-point between the speed of the traditional big ring and climbing power of the lower gears of the smallest ring on a triple chainset. This means the small ring can be disposed of, saving a great deal of weight. They typically feature a double chainring setup with 34- and 50-tooth rings, and have become incredibly popular for their combination of power and climbing credentials. The TT sprinter may still appreciate the traditional chainset in an elbows-out sprint to the finish line, but for big climbs or those still developing their riding strength, a compact chainset is a good choice. There are three formats of compact chainset, providing more precise gear ranges for different styles of riding. These formats are compact, semi-compact, and sub-compact. Semi-compact: The semi-compact, sometimes called the mid-compact, includes the same 52 tooth big ring as the racing standard, but with three teeth slashed from the small ring leaving a 52/36 format. This is a hugely popular choice among modern cyclists, providing the full gamut of speed while making the climbs a little more manageable. Compact: As mentioned above, the traditional compact offers 50/34 tooth chainsets, providing a trade off in favour of power over climbing. While it lacks the all-out speed of the standard racing 52 tooth ring, it strikes a good balance between speed, acceleration, and climbing gears. Sub-compact: The sub-compact drops the gear spread down to 46/30, perfect for big climbs or more leisurely cycling. However, where they’ve really come into their own is on the gravel bike, facilitating transition from fire road to trunk road, and mountain climb to trail. – A further option, but generally only seen on entry-level bikes, is the triple chainset with rings of 30-42-53 teeth. This provides the ultra-low ‘granny gear’ option for ‘sit and spin’ type hill climbing and adds extra weight. Crank length: Most road cranks are 175mm long, but riders with legs shorter or longer than the average may feel more comfortable on cranks that better match their measurements. Options from 165mm to 180mm cover different limb lengths – it could be worth your while to research what crank length is recommended for your inside leg measurement. The vast majority of road cranksets will use aluminium cranks but carbon fibre versions for ultimate weight savings can be found on top-end models. – Cartridge BB: This older standard features a small diameter axle and internal bearings that are contained in a metal cylinder which screws into the BB shell as a single unit. Older and budget road bikes may feature cartridge BBs with ‘square-taper’ axles. – Press-fit: Press-fit bottom brackets are found on many mid- to high-end carbon bikes from multiple manufacturers. They involve bearing seats that are moulded into the structure of the frame, with the bearings then pressed in to sit directly in the BB shell (which can be oversized, or not). The main advanage of the press-fit generation of BB standards is increased frame and pedalling stiiffness, but there are many different sizes and iterations according to manufacturer – BB30, PF30, BB90 ,PF86/92 to name but a few – and not all are interchangeable. Check which standard your bike is running when replacing a chainset or BB, and if in doubt have a professional mechanic do the replacing (many critics of the press-fit standard point to it being difficult for home mechanics to tinker with). Chainrings: As above, road chainsets will usually use two rings with the traditional 39-53 setup geared towards race riders and the 34-50 compact chainset favoured by climbers and leisure cyclists. Alternatively you can opt for a triple ring for the maximum range of gears. BMX cranksets are generally sold separately to the bottom bracket (BB) and chainrings, rather than as a single-unit ‘chainset’. They consist of the crank arms, axle (spindle) and any necessary bolts and spacers. As with all BMX components, they need to be tough, and able to withstand the pressure of hard impacts on concrete, riding on rails, stacking big jumps and tricks. For this reason most BMX cranks are made from steel, with higher-end cranks featuring lighter cromoly steel. Some race cranks may be made from aluminium or even carbon fibre to shed weight, but the majority are tough, dependable – and fixable – steel. Which BMX crankset is right for me? BMX cranks fall under four main camps: three-piece, two-piece, one-piece and race cranks. – Three-piece: This is the most common type of crankset found on freestyle BMX bikes and features two separate crank arms which attach to a splined axle. – Two-piece: Two-piece cranks feature the axle integrated into one of the crank arms. In most cases three-and two-piece cranksets are compatible with the same bottom brackets so long as the axle is the same diameter. They are commonly used in conjunction with the mid-style bottom bracket standard. – One-piece: This is where the axle and crank arms are a single piece of steel. Most commonly found on entry-level or kids’ bikes. They require the use of American-style bottom brackets. – Race cranks: These may be closer in spirit to MTB cranks, using an external BB and aluminium or carbon crank arms to save weight. They may be available in two- or three-piece versions. They require the use of euro-style bottom brackets. When replacing or upgrading your BMX crankset it’s essential to get the sizing right. The two most important factors are axle diameter and crank length. • Axle diameter: The two common axle diameters are 19mm and 22mm, so check before you buy that your bottom bracket is compatible. Axles will also be made with different spline patterns – 48-spline, 16-spline and 8-spline are the three most common standards. Check both axle diameter and spline pattern to ensure that your existing sprocket will fit on your new cranks. • Crank length: This is measured from the centre of the bottom bracket axle to the centre of the pedal axle. Most stock bikes have cranks of 170mm or 175mm, but you can get them as short as 140mm and as long as 190mm. Choose crank arms that suit your inside leg measurement for optimum comfort and control. Keep your BMX crank set running as new with spare axles, spacers and bolts. Parts can wear with time and hard riding. Our range of replacement crank arms, spiders, bearings, bolts and spacers will help prolong the life of your chainset keeping your transmission running as smoothly as it should.